Forever on Thanksgiving day, the heart will find the pathway home. 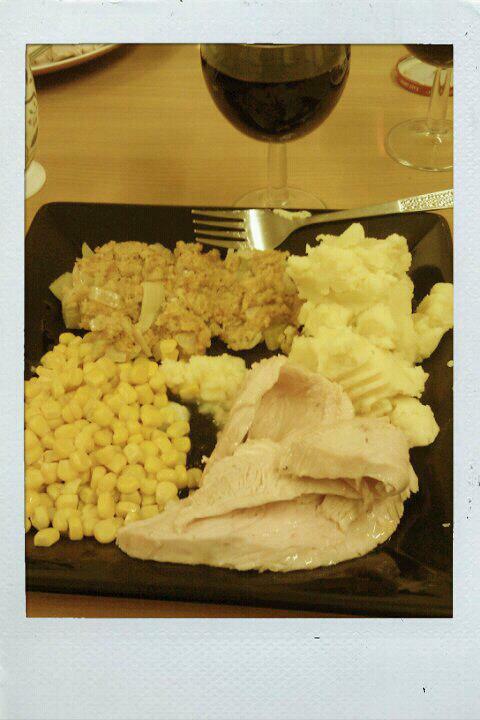 Friday night was Thanksgiving, part two. A girl in my course hosted a Thanksgiving party at hers and because we all have the misfortune of being poor students, we ordered pizza. But it’s an excuse to party with friends, so I won’t complain. We wrapped up our Thanksgiving celebrations on Saturday in Rickmansworth. My neighbours from home have a friend who lives about 20 minutes from us with her husband and two children and she very graciously invited Tom, Jordan, Kathryn and I over to their home for Thanksgiving dinner. It was a proper holiday dinner- children running around everywhere and adults drinking too much wine while watching college football. (ESPN America proved to be a blessing for the men.) The scene was chaotic- think a cross between the Griswalds and Home Alone- but it felt like home and we loved every minute of it. You can take the girl out of America, but you can’t take America out of the girl. Put your mind in the clouds, keep your feet on the ground and go where you want. You can change your life if you want it. London continues to shower me with opportunities I may not otherwise be privy to, so I feel the timing of this blog is quite appropriate, what with Thanksgiving just hours away. 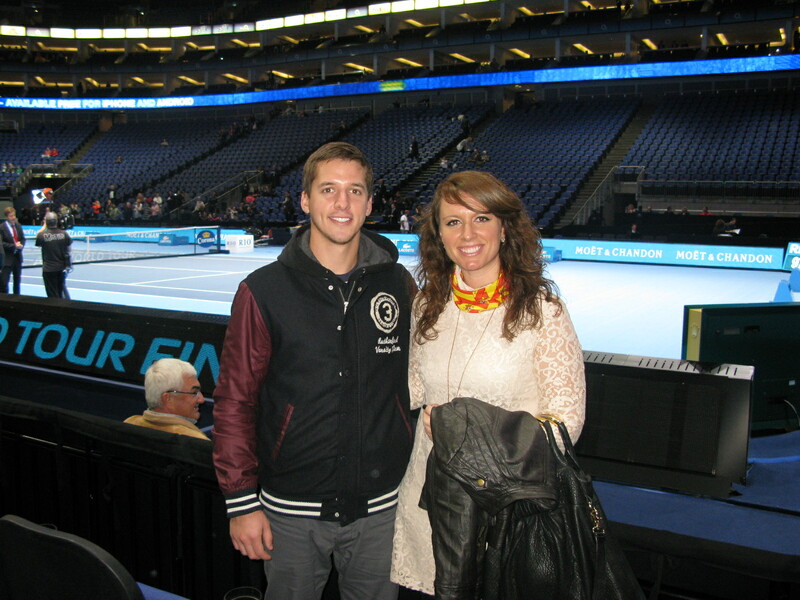 I’ve spent the past three days in South East London at the O2 Arena, watching the world’s best male tennis players. Sunday and Monday I took advantage of the [free] opportunity to watch the players practice and after months of waiting, yesterday was finally the day for Tom and I to turn in our tickets for seats inside the arena. The afternoon brought us Mardy Fish (whom we cheered on simply because he’s American) versus Jo-Wilfried Tsonga (France). It was the night match, however, that we were greatly anticipating. Rafael Nadal. Roger Federer. Arguably [or, if you’ve seen either one play, not so arguably] two of the greatest tennis players to ever live. A “Fedal” match is something tennis fans hope for in every tournament. With the exception of this past year, they are typically always the first and second-ranked players and their skills on the court always make for an exceptional match. Tom and I were incredibly lucky to have gotten tickets for this match, as the line-up is always completely unknown up until the day prior to the actual match. 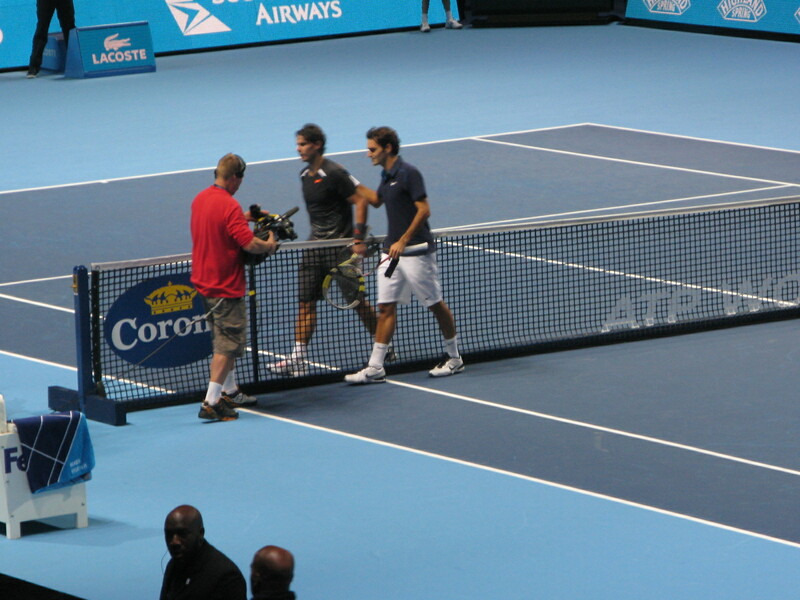 Even luckier was our seats- we were but rows from the courts, another rarity for a match like this one. Unless of course, you have loads of extra money to spend. For the past six years, (thanks to someone very dear to my heart) I’ve been a Nadal fan through and through. A gentleman on and off the court, it’s hard not to fall in love with him over and over again. I’ve struggled to pinpoint exactly what it is about Nadal that is so like-able, until I sat at a practice court the other day and overheard some women talking. One woman said, “He’s very unassuming. He just doesn’t know how good he actually is.” And that’s it- he’s as humble as they come. He’s soft spoken and one very rarely sees him react to one of his own plays- good or bad. He’s often badgered by journalists to talk about his skills, but he hardly takes full credit for the way he plays on court. He never makes excuses for the days he’s off and he never gloats on the days he slaughters his opponents (which is often). It’s hard to not be so passionate about a guy who seems so genuine. He’s as talented as they come, but he’d never admit it. Unfortunately for me, Nadal took quite a beating from Federer. The match lasted but one hour and Nadal walked away with a 6-3, 6-0 defeat. Federer and Nadal usually give one another a run for their [very large sums of] money, however, it was clear Nadal was worn out and Federer played a better match. Walking through crowds of Swiss fans with a Spanish flag draped around my neck as a scarf was hardly the highlight of my night, but one can’t complain when one has tickets to one of the biggest matches of the tennis year. And speaking of having the opportunity to do great things, I’d like to take a second (in the spirit of Thanksgiving) to say thank you to everyone who has remained interested in my journey both in London and through life. I’ve been gone but not forgotten and I’m grateful that you are all so interested in my happenings here. I was in London last Thanksgiving and have reached full circle (not for the first time) as I, once again, celebrate my favourite holiday from across the pond. Unlike you, I will be working tomorrow, but have the opportunity to celebrate on Saturday with a very generous family introduced to me by my very lovely neighbours. I will gather with about 80 of their friends and family members and I am grateful to be able to celebrate in some way, even though I cannot be with my own clan. Thanks for the support, thanks for the love, and thanks for the continued interest in my life and what I do here. Have a safe holiday. Have a happy holiday. And get to bed at a reasonable hour tomorrow night- Black Friday deals start early. I fear I’m neglecting this blog a bit more than I should. I suppose it’s a good sign though. It means I’ve found a routine and I’m officially settling in as a Londoner. School has me occupied, as much of what we do it self-taught. Meaning, we get minimal direction from the professors and then get sent on our way to survive the public relations field. At the moment, I’m finding ten photographs that represent Hofstede’s views of power differences in the United States (don’t ask, it’s impossible) and planning two PR campaign simultaneously. I should be getting paid for this stuff, not paying someone else to watch me sweat as I scramble to hit deadlines. Although, those of you who know me know I’d never scramble to do anything. One, because I’m way too laid-back for that; two, because I’m not a procrastinator; and three, because I hate to move fast. I was looking for dramatic effect. Work is going well also. I’ve been given my own work e-mail (there’s something so official in that and again, it’s the little things) and I’ve started performing “real” tasks. This week I pulled looks for photo shoots, delivered said looks to various locations for the shoots*, e-mailed various publications to see if anyone is publishing menswear collections in the lead up to Christmas, and decided which online publications would be best to target for the holidays. Working in fashion has been eye-opening to say the least. It’s amazing how much goes into one article of clothing. I understand the work, but to see it first hand is quite interesting. With that being said, I think I may try to find a new place to work next semester. It’s not that I don’t enjoy where I am, but the more time I spend around clothes, the more I want to try my hand in the entertainment industry. Mom, this does not however, mean that I will stop buying them. This past week was a bit quiet on the adventure front, but Jordan, Kathryn and I did manage to see Twilight: Breaking Dawn Part 1 at midnight. To make a long story short, it was boring. No need to make two films out of what clearly should have only been one. The wedding dress was the best part of the entire film, save for the front of it. Fashion saves the day yet again. *I spent two hours transporting £5000.00 worth of clothes across London. 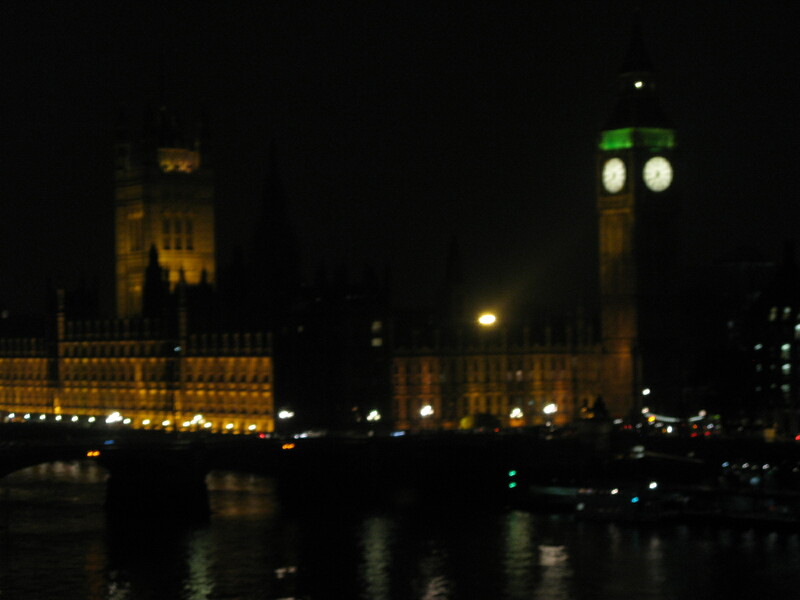 I lugged garment bags from one bus to the next and navigated the winding streets of Westminster. If that’s not trust on my boss’ part, I don’t know what is. All this living is so much harder than it seems, but girl, don’t let your dreams be dreams. First of all, thank you to everyone who sent along well wishes for my birthday- I appreciate the time you took from your day to remember mine. Sunday I picked up my friend Jillian from the airport as she flew in for the week to visit. Jill was my boss at the radio station and we formed a great friendship. I had the honour of having the first guest in London and I love that she flew all that way to see me. Monday I put my tourist shoes back on and spent twelve hours (literally) walking from one end of London to the other seeing the sights. I have to say, it is very easy to take advantage of the touristy sights in a city like this when you live here. I don’t spend much time in those neighbourhoods, but when I do I tend to ignore the sights because I’ve seen them all before. On Monday, I re-looked at it all and really took it in again and the sights are undoubtedly incredible. 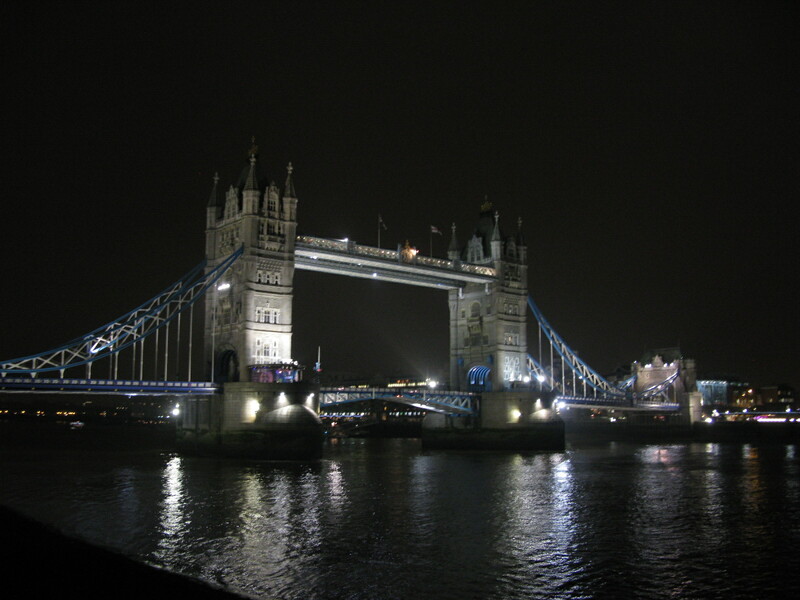 We decided to head to the Eye and this time, I saw the bird’s-eye view of London at night. It’s just as gorgeous from above. I also allowed myself to reflect a bit on the experience. 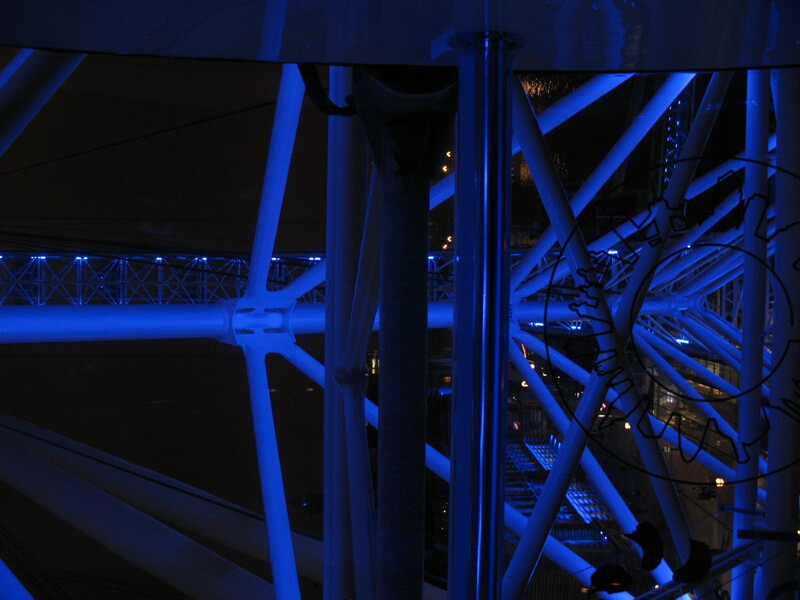 When I got to London last year, the very first thing I did was ride the Eye. It was in that moment that I realized I’ve officially come full circle. If you had told me, one year ago, that I would be in that very same spot as a resident of London, I would have written you off as crazy. It is amazing what can happen in a year. Thursday night was back to my VIP lifestyle as Jillian got 4 tickets to a Rival Sons show in the Angel neighbourhood. This means that her, Kevin (her friend and travel buddy), Tom and I had full reign over the venue. We crossed back and forth between velvet ropes, watched from backstage and chatted with the guys after the show. Reality, our friendship is over. Friday night was “I love the 90’s” night at an Australian bar in Finchley. This night needs no explanation. My love for anything 90’s far outweighs my love for most things. And now, here I sit, just returned from the England vs. Spain footy match. 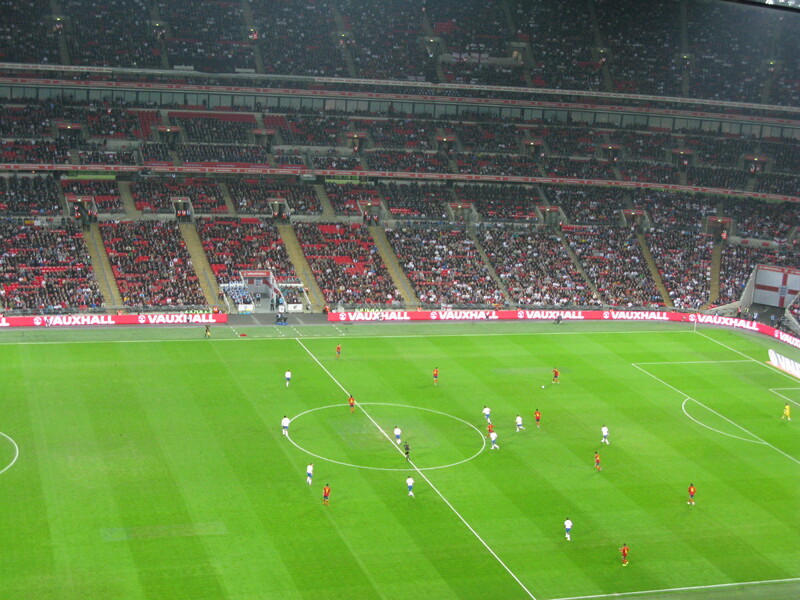 England came out on top with a 1-0 victory. I ate the worst cheeseburger I’ve ever had, but the match was a great time. I love the spirit of the fans and it was so easy to get wrapped up in the excitement of it all. My goal for the week: learn the words to “God Save the Queen”. I’m not an honorary Englishman until I can sing along with the best of ’em. Why don’t you go where fashion sits, puttin’ on the ritz. 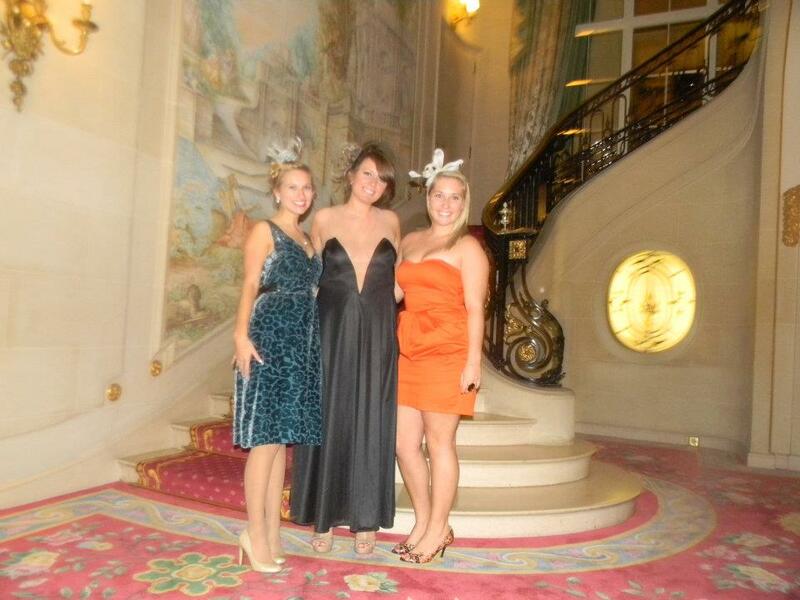 In honor of my birthday, Jordan, Kathryn and I decided to see how the other half lives and have high tea at the Ritz. For those of us who cannot afford such a luxury every day, experiences like that should be illegal. We did not want to leave. As soon as we hit the steps, the doormen had the doors open for us, welcoming us into the most spectacular lobby I’ve ever seen. (And I’ve had the great fortune to see and stay in some amazing hotels.) We were ushered in by six gentlemen who kindly showed us the way to the cloak room and then on to the Palm Court where we were given our table. 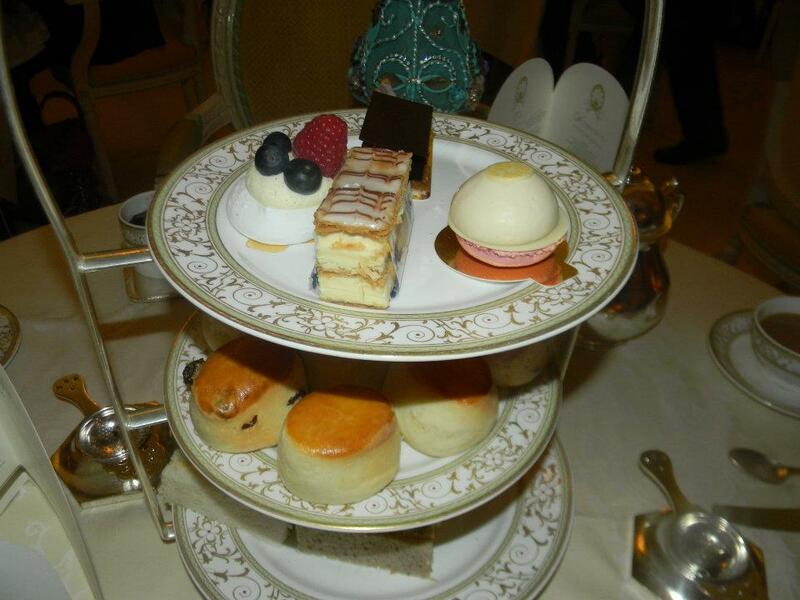 We started off with tea (Passion Fruit for Jordan and I, Traditional English tea for Kathryn) and then moved on to the sandwiches, none of which I would typically eat but because they were made by someone at the Ritz, they tasted like heaven. The real highlight though, was the scones and clotted Devonshire cream. Amazing. I ate about six of them and only stopped because I would have actually exploded had I eaten anymore. We finished off with lemon and raspberry custard and mini pastries, all eaten with our genuine silver spoons. After much hesitation, we gathered our things and begrudgingly headed back to….pubic transportation. Pity a fairy-tale has to be such a fleeting moment.